Description: Axachange is made to improve the experience of day to day use for trades. 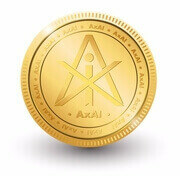 Custom Description: Axai is; 1) A Loyalty token to Reward Supporters who lease to our Waves Node WAT. And Turtle Node AImining. 2) A Utility Token to make Purchases in Axai Marketplace ecosystem adds and listing. 3) Membership token for internal use only for KYC approved. White listed and (Access to Lottery coming soon). Link to Axai KYC: Note: for members club. https://www.yoti.com/connect/738624c6-61ab-4fd7-ae3b-ba7b31954dbd Approved KYC members can directly get Axai. We're grateful for your support, and look forward to updating you more regularly on new partnership releases and company news. What you can do with Redeemed Axai? Axai listed on Nanu Exchange, You can Trade Axai on Nanu as Well as on Waves DEX. Luxtrade: https://luxtrade.online//?invite=QBSTNY Nanu Exchange: https://nanu.exchange/exchange#btc_axai Thankyou!???? Axai is listed with Waves Mania You all welcome to play the games and Vote Axai. http://wavesmania.net/AXAI T. You Enjoy the Games. DISCLAIMER: Before you enter foreign exchange and stock markets, you have to remember that trading currencies and other investment products is trading in nature and always involves a considerable risk. Trading cryptocurrencies such as bitcoin and blockchain tokens such as ether carries a high level of risk, and may not be suitable for all investors. As a result of various financial fluctuations, you may not only significantly increase your capital, but also lose it completely.